Professional services social business opportunities gravitate toward two poles: developing social business services to extend firms’ relevance and core services and using social business to increase firms’ productivity. Both poles require firms to evolve cultures, organizations and practices. The Chief Digital Office is packed with ideas and tools for using digital social business to transform brands, businesses and enterprises. Professional services firms are quintessential knowledge enterprises that face twin threats of online collaboration and global sourcing. Management consultancies, information technology firms, marketing firms, law firms, engineering firms, design firms and medical practices can mitigate these risks by going on the offensive: using social business, they can get much closer to clients and prospects. They can anticipate needs and innovate new services much more quickly than emerging competitors and offshore substitutes. The underlying structures of many professional services are under pressure. The depth and breadth of people, thought leadership and spaces online is making it easier for clients and prospects to perform some of the basic due diligence and research that was formerly the purview of professional services. In effect, in the Knowledge Economy, the entire world has become a professional services firm. Clients conduct preliminary diligence themselves and postpone engaging the firm until later in the decision making process. Even more poignant, firms’ practice of hiring associates and staffing them on research engagements to get experience no longer works because clients object to paying associate billing rates for such services. Lower cost offshore providers increasingly field complex services that are often staffed by associates and senior partners with extensive onshore experience and similar educational backgrounds. Even prestigious global firms have laid off lower level associates in significant numbers, and this weakens their firm structures later when they need junior partners. Management consultancies come in myriad flavors but all advise clients’ senior leaders in strategy and operations. Since social technologies change the economics of interaction and collaboration, all clients are affected. These firms stand to gain rare advantage by fielding social business services. Access Strategy and Big Four adoption reports. Information technology firms are focused on advising clients in buying, customizing and implementing large I.T. investments. Most enterprise software vendors are bolting on social features to maintain their products’ relevance, but senior I.T. firm executives are too often ignorant about social’s transformational potential. Many firms also contain management consultancy business units. I.T. firm adoption report here. Marketing, advertising and PR firms have led the way in developing social media advisory services, but these are focused on marketing and promoting, not developing relationships and trust. Marketing firms have unprecedented potential to use social business to transform themselves and invent far-reaching new services, but they need to reorient themselves first. MAP adoption report here. Law firms see many parts of the law being affected by social technologies, but firm partners are largely ignorant of how emergent collaboration works. Some firms have fielded offerings around social business/social media policies, but unless partners leading these engagements have deep understanding of digital social behavior and potential, they too often weaken clients’ ability to realize business value. Firms can have the best of both worlds by becoming first class social business practitioners themselves. Architecture & engineering firms face clients that increasingly have their own ideas based on projects across the world. Even though physics haven’t changed, all parties in their value chains increasingly find each other and exchange ideas and advice extemporaneously, so firms will gain immeasurably by being in the room themselves. Design firms face exploding demand because business and government clients increasingly recognize that everything can be designed: services, businesses, spaces, experiences and, of course, products. “Design” is a nexus on the Knowledge Economy, so firms will manage their positions on the wave by getting—and staying—plugged into emerging client needs, which often come from unusual places, like social networks. Financial services firms, whether commercial banks, insurance firms, investment advisory, private equity, investment banks or other can use social business to learn about prospects’ rapidly evolving motivations and to show their relevance to them. See Financial Services Social Business Opportunities. Medical practices are under pressure around the world because G7 governments are scrapped for cash and pushing for value-based care, so providers are scrambling to adjust. The U.S.A. is an extreme case in which providers, payors, employers, government and patients are confronted by creating a healthcare system out of several cottage industries. See healthcare social business opportunities. Professional services are notable for their focus on client relationships and their conservatism. 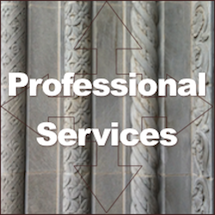 Although many of their services are governed by formal standards, in virtually all cases, the professional services firm either creates or bundles services to fit client needs. Moreover, services are intangible, “results” are often difficult to judge before they are delivered, and services usually represent relatively high cost to the client. Considering these traits, it is easy to understand why professional services require a high degree of confidence between firm and client. This is why professional services firms invest considerably in creating strong client relationships. Conservatism is another pillar of the professional services firm because practitioners strive to avoid anything that would compromise their reputations and investments in client relationships. Firms are typically laggards in adopting disruptive technologies and practices like social business. It’s a green field. Social Business POV (SBPOV)—Social business is transforming all organizations, namely clients and firms themselves. Clients increasingly ask their management consultants, attorneys, engineers, designers and marketers for social business-oriented advice, but in 2013, few firms have declared a formal point of view that expresses their due diligence on how social business is relevant to themselves or clients. In 2013, this increasingly weakens their authority because all types of firms are being pressured by their clients and customers to adopt. SBPOV will conduct due diligence on social business relevance to the firm and its stakeholders and competitor/substitutes. It uses due diligence to educate executive partners and to collaborate with them to develop the formal point of view. Social Business Practice Development (SBPD)—Firms that create their social business points of view increasingly find opportunities to offer social business services related to their core competencies because clients and other stakeholders are using social technologies. This opportunity examines the firm’s diligence/POV effort in light of firm “corporate” strategy and the competitive landscape. Social business is likely changing the context around client business that, in turn, affects the firm’s services. SBPD goes on the offensive by launching services that harmonize with the firm’s non-social business services and serve to extend them into the digital social arena, in accordance with compliance and regulatory realities. Peer2Peer (P2P)—”Professionals” are peers by default, but few firms have moved to unlock emergent collaboration among their members. Members at all levels of seniority are locked up in practices, so culture change is needed to enable members to discover and tap the best resources for client work, real-time. Peer2Peer is an internal digital network that interoperates with existing firm technology solutions and often external digital venues, but it focuses on realizing the culture change needed to unlock the firm’s potential. It may build new or reuse/relaunch an existing technology if that is more optimal. Its hierarchy of social actions measures results with by showing interactions’ impact on trust. Management consultancies, I.T. firms and marketing, advertising and PR firms lag significantly in adopting social business. See CSRA’s adoption report, which quantitatively ranks leading global firms. Its executive briefings summarize rankings for firm and client leaders. Social Business Development (SBD)—Studies increasingly show that business development executives (including firm partners) that use social technologies outsell those that don’t. In professional services, the secret is engaging highly qualified prospects online by responding to their questions and assertions online. High-quality digital interactions are business development annuities because prospects set the context for the conversation, so when a professional shares relevant insight, everyone sees his/her expertise in context, today and forever, and these conversations accumulate. SBD develops a strategy and mentors select professionals during pilots. It measures results using the Social Network Life Cycle Model. Social Business Recruiting and Alumni (SBRA)—Most professional services firms use old-school tactics to maintain connections with their “alumni,” and they continue to use 20th century recruiting methods. Few firm executives understand that social networks have completely changed the game. SBRA analyzes the firm’s interactions with existing alumni network as well as its recruiting activities. Then it redefines the “employee” life cycle and designs pilots in which firm members have highly efficient, continuous interactions, in public where possible. Interactions focus on developing trust and relationship across the employee life cycle, so the firm boosts its pipeline of alumni-referred business opportunities as well as its supply of qualified entry level and experienced hires. In-depth CSRA analyses and reports on professional services transformation. CSRA helps professional services firms act on social business opportunities: by understanding clients, markets and value chains in new ways using social data; by interacting with clients and other stakeholders using social technologies; by transforming organization to maximize collaborative innovation. To learn more, contact us.